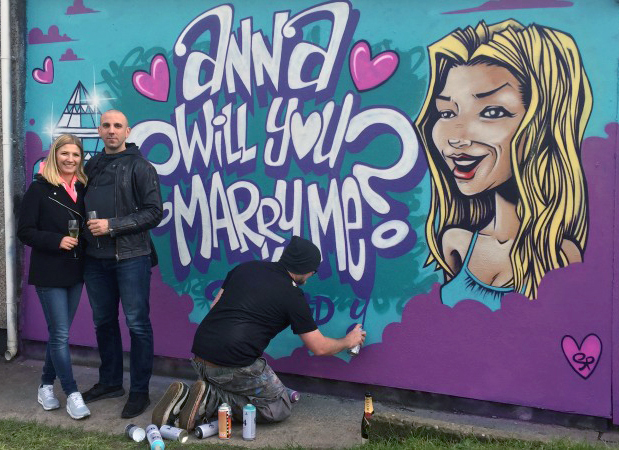 Upfest & SPZero76 helped me with my proposal! Jago March 14, 2016 Featured Comments Off on Upfest & SPZero76 helped me with my proposal! This Saturday I asked my gorgeous girlfriend Anna if she would do me the honour of being my wife! After a few months of planning how I would pop the question a wacky idea appeared in my mind. A few years back we contracted a graffiti artist that we met at “NASS fest” Keith Hopewell AKA SPZero76 to paint our kitchen wall. He did an amazing job. We both love it and it has become a part of our home. I thought I could you the same guy to create a proposal to Anna as I knew he would deliver something she would instantly love. So I set about planning it (six months ago). Luckily I had a great team behind me to assist. Upfest is a fantastic street art shop based in Bristol. The owner there a guy called Stephen Hayles found me a wall for SPZero76 to spray. He sent over the sketches nailing the whole concept first time. The next step was the ring. My boss knew a guy in Hemel Hempstead called Marc Slipman. He owned a lovely little family run jewellers call Daisy Chain Jewellers that made bespoke pieces to order. Marc spend a lot of time with me working out the perfect ring. We went for a 1.2 ct diamond with a platinum setting. A few weeks later it was made. It looked amazing. Now to pop the question. I was in contact with Keith so we could time it that just as he was finishing Anna and I would walk past. I was getting a little nervous at this point as it was all becoming very real. An unsuspecting Anna and I went to a pub called the Spotted Cow a few doors down from where the wall was being sprayed. I was glad for the Dutch courage and thought giving her a drink might help my chances! The phone vibrated just as we were finishing our drinks and it was crunch time. We casually walked down North street and Anna spotted Keith and the wall. She stared at them both for a few seconds then looked at me. I was presenting the ring. “Really” was all she could say. Looking for confirmation, I put the ring on her finger and she began to cry. Stephen started running towards us armed with a smile and a bottle of Champagne with two glasses. “She said yes” was added to the piece and we all celebrated.